I don’t know about you, but I genuinely love to grab a nutritious snack, especially on a very hectic day when I am running late, there are too many things that need to be done in a short time, I have no time for a proper lunch but still want to eat as healthy as possible. As I hate to eat any junk food from the street, full of fat and salty as hell or, even worse, NOTHING, I told to myself one day that I could fix my own lunch for a day like that. All I had to do is to wake up about 10 minutes earlier and get ready to prepare my nutritious, high in protein and B vitamins snack. The paste can also be refrigerated up to 2 days. In a small saucepan bring 100 ml. water with salt to a boil and simmer 100 g of red lentils about 10 minutes, or until are al dente. Transfer the stew of red lentils to a bowl, in which you add the rest of the ingredients, and mix them all with a stab mixer until the paste is smooth. 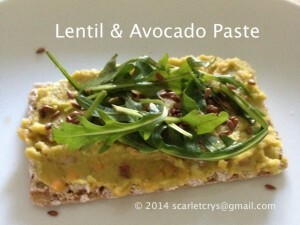 Serve the paste on a slice of cracker, preferably multi-grain, with Rucola Salad and flaxseeds on top of it, or set your imagination free and see where it goes. This entry was posted on Sunday, April 20th, 2014 at 4:00 pm	and is filed under Fitness & Spa, Health, Recipes. You can follow any responses to this entry through the RSS 2.0 feed. You can leave a response, or trackback from your own site.